"For twenty two years, I've closed my eyes each night and pictured my little house on the coast, the front porch, the late afternoon sails on my little boat. Thinking of those things brought me the most peaceful feeling." 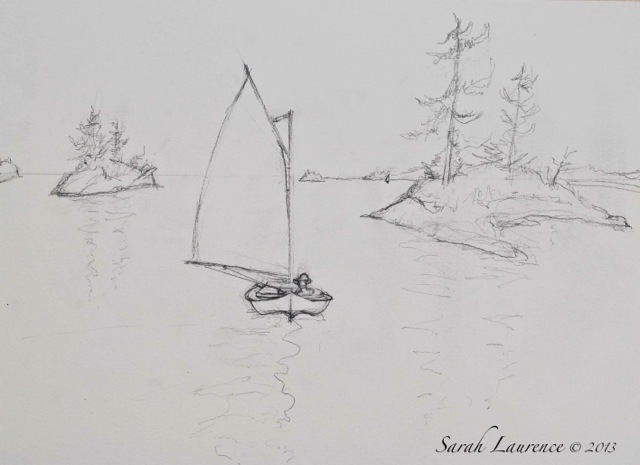 I usually paint from life, but sailboats move too fast to sketch accurately. While visiting my family on Nantucket Island, I headed to the Rainbow Parade with my DSLR Nikon camera. From Brant Point I was close enough to capture the old wooden boats sailing past the lighthouse. I couldn't simply copy the photo because the client asked for a Maine background and Nantucket Island is in Massachusetts. 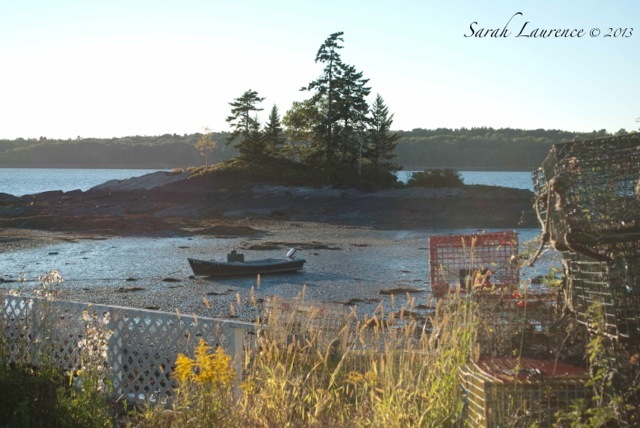 Maine is farther north and has a different feel: the islands are rocky and coniferous. 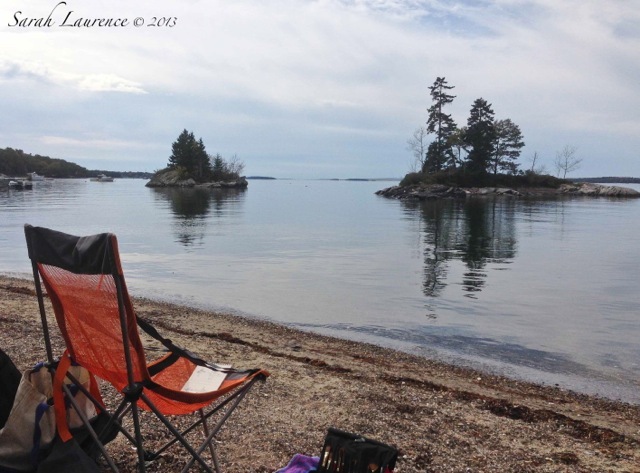 The day I set out to paint at Lookout Point, the sky turned an ominous grey as the tide was falling. I worked quickly but the sea became mudflats as raindrops fell, blurring the paint. In the rush to finish, I'd also gone too dark. Watercolor is the most challenging of all paint media because there is no way to fix a mistake. You can go darker, but you can't go lighter. My painting was a disaster. I cut my losses by picking up a couple of lobsters. Allen's Seafood at Lookout Point sells them live off the docks at $5 a pound. My client is a professional chef so I felt she'd understand. 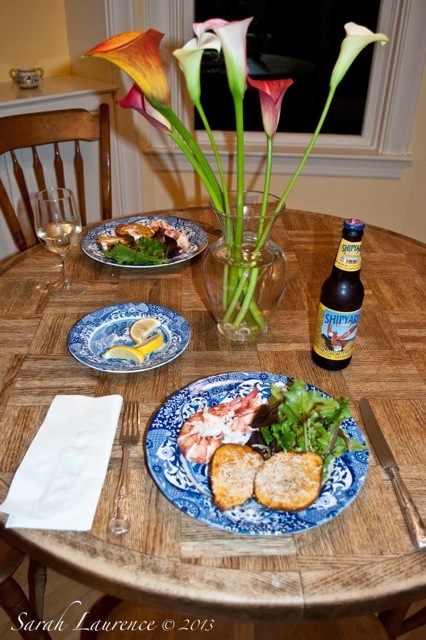 My husband boiled the soft shell lobsters on the barbecue and picked them out of their shells. He'd bought a bouquet of calla lilies to cheer me up. A fresh farmers' market salad, baked potatoes and locally brewed Shipyard Ale rounded out the meal. It was a happy ending to a disappointing day. Another day, another attempt, this time at home. It was getting too chilly to work outside. 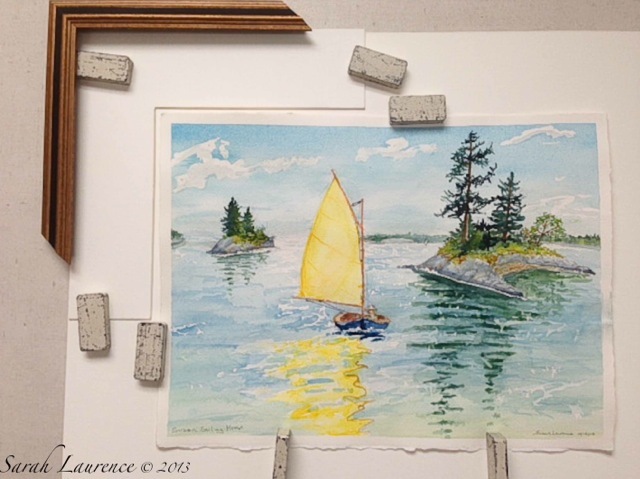 I set up my laptop with the Nantucket sailboat photo and propped up a more successful watercolor of mine of Lookout Point. Blending memory and imagination, I merged the images in my head. Before painting a watercolor, I do several gesture drawings in a sketch book. These 30 second ink sketches of the main elements allow me to test several compositions before committing to paint. Once I've chosen the layout, I transpose the sketch in pencil with more detail to heavy weight paper taped to board. Then I mix my colors and slip into a meditative trance. Two days later the painting was complete. The penultimate stop was the framers in Topsham. 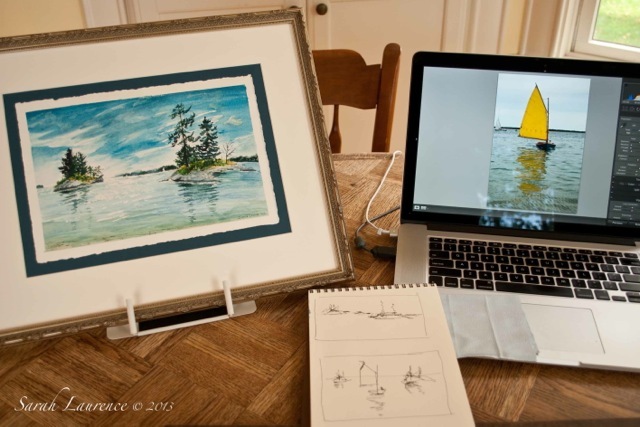 I usually frame watercolors in natural wood, but this client had decorating restrictions. 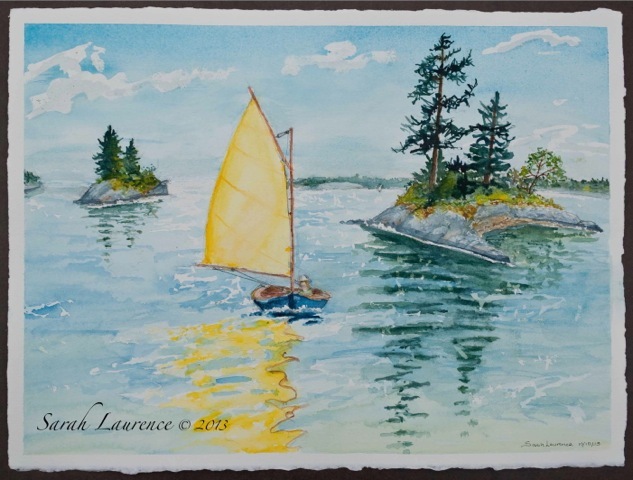 My watercolor might hang with family heirlooms in gold gilt frames or beside other pictures framed in black-painted wood. I emailed photos of the options. Since it was hard to visualize how well this would integrate in her new home, she decided to use her local framer. UPS fragile packed the painting, but my work wasn't over. Once I've finished the first draft of my novel, I'll begin work on a companion watercolor for this client. (Thanks, Dad, for mailing a photo of a moored gaff rigged yacht). It's a wonderful feeling to capture a dream. First of all, I love the process you so well described. 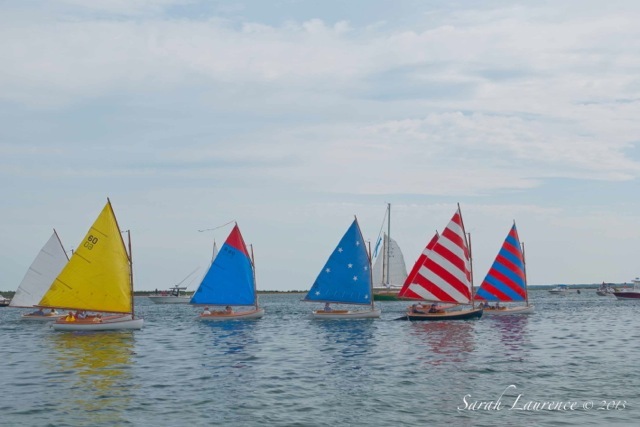 Secondly, the photo of the sailboats makes me of think of winged creatures travelling across the water. It's a superb shot. Many thanks. 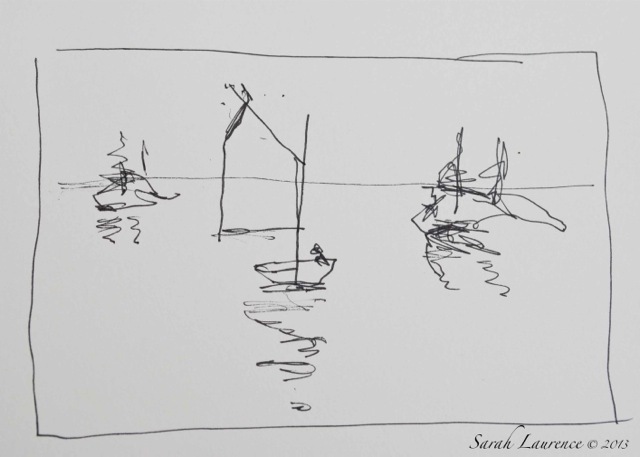 It's so interesting to see the process you go through in creating a painting, Sarah. I love the yellow sailboat and its reflection in the water. Your client must be very pleased with the results! Your candor and indefatigable approach to your work are refreshing, Sarah. I love the behind-the-scenes look (especially that lobster!). And your painting does inspire a peaceful feeling. Well done! So interesting to see how the lovely watercolor was created. The reflections on the water are really beautiful! The boat looks like it can take you wherever you want and at the same time it looks like it can stay in the inlet as long as you want. Your painting "brought me the most peaceful feeling" ! Thank you, Sarah! I've just read your former posts. The autumn leaves in Maine are amazing. I've always loved to see your fall pictures at this time of year. Maine's autumns are really something!! Oh wow! That is truly stunning. I also found it so interesting to read about your process. You are so talented. Glad you were able to soften the blow of a disappointing day with lobster and calla lilies, but you achieved a gorgeous final result with this painting. That was so interesting to read. I didn't realize how much work there is behind the art. The final product is beautiful. You are truly talented! Fascinating process, Sarah. I enjoyed seeing all the photos of the different steps. Thanks for sharing. I love the vibrant freshness that pops off the page with the finished painting,and it's such a delight to watch the process that brought you there. Thank you for sharing the creation. Since I've not been doing much internet lately, I just saw those glorious photos of fall in Central Park. Absolutely grand. Sarah, I thought I had commented on this wonderful post. I was hooked when seeing your buttery yellow sail. Delightful painting and fun to see your process. You live in such a beautiful area.